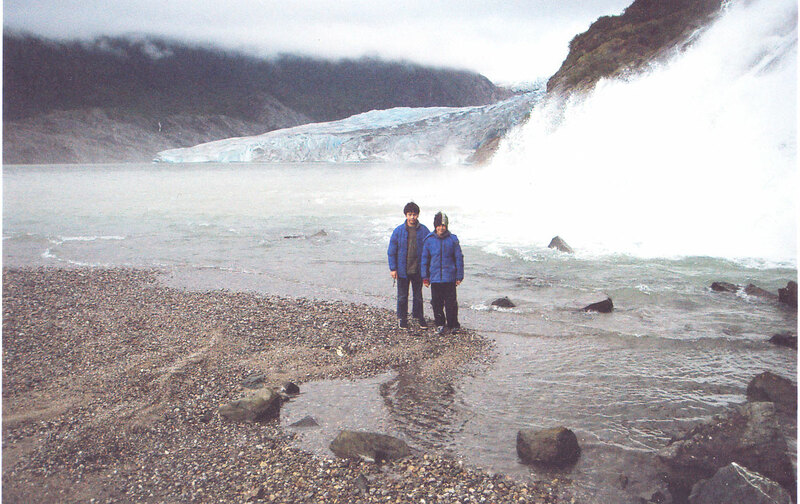 John is a senior in high school now, but he and James will never forget our visit to this spot -- one of the most magical places in the world. In the background is Mendenhall Glacier. Like most of the two dozen or so glaciers that pour down from the Juneau Ice Cap (the main exception has been Taku Glacier), Mendenhall has been retreating for a long time. When I was a boy, living a mile and a half to the west, the glacier partly obscured the waterfall. You can still see signs posted every couple hundred yards, warning visitors to get no closer. 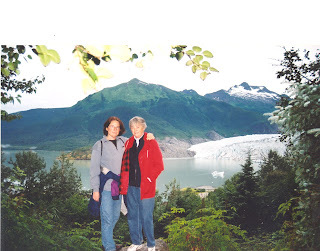 When we lived in Juneau, a woman was, in fact, crushed to death by falling ice, but that was in winter, I think, when Mendenhall Lake freezes over a couple feet. You can't easily get that close in the summer. John has been here twice. The first time, he stood by the lake across from the big glacier and asked, "Is this the North Pole?" The cliffs over which the water falls, are in places streaked with quartz. Look closer at the rocks that the glacier has left in its retreat, and you can still find garnets in the scheist, and other beautiful stones. Follow the East Glacier Trail around the falls into a valley towards the backside of Thunder Mountain. I never made it as far as I wanted -- some day I'll return. Go into the visitor's center, point the scope onto Boulder Mountain behind Nugget Creek, and sometimes you can find mountain goats, little white specks thousands of feet above. A magnificent stuffed timber wolf now also stands in the center -- hit by a car, they told me. There are plenty of live animals around, too. As we walked up the ramp to the Visitor's Center, a small but adventurous bear was coming down. He went over the rail, and clambered down the rocks to avoid us: the boys were deeply disappointed. Beavers created a pond out of another little creek that flows into the river just beyond the parking lot. Bright red sockeye salmon fight their way up the creek every fall, attracting bears. Even the plants in Mendenhall Valley enchant: the freshly-washed cottonwoods, the deep mosses, the pink flowers establishing themselves in white sand when the glacier has past. Of all the places in the greater Juneau area, hundreds of square miles of mountain and fjords, the smell here seems freshest, as if the world had been created this morning. And who can deny it -- with mists rising off the mountains, water pouring down from deep mossy hills, many-colored mushrooms popping out of the green? Here indeed, where the glacier passes, the world comes to life anew. ice was still only an inch and a half thick. ﻿Tourists off big ships that tower over downtown Juneau climb out of big buses half a mile from this spot, but never get here. They don't climb the rocks and bath unclothed in the little ponds up in the glacier-scoured hills, as we did when we were boys. They don't chase the salmon. They don't ski across the lake, because they don't come in winter. They should do these things: here where the world is still young.